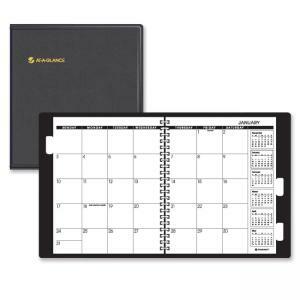 The Five Year Monthly Planner can be customized to fit your individual long-range planning needs. Allows you to plan up to five years in advance with yearly tab dividers and five full years of monthly pages. Each two-page spread has a full month of unruled daily blocks for writing appointment information as well as past, current and four future months for reference. Planner has a 22 multi-ring wirebound cover that is simulated leather. Pages are made with at least 30 percent post-consumer material.